It is that time of the year again, when all I want to do is put lemon into everything and more importantly, when I want to eat cottage cheese rolls all the time. They’re a nice middle between a comforting yeasty roll, which has a more wintry feel to it, and a fresh, lemony filling, that screams spring. And while I was going through my recipes, I realized that I haven’t shared this re-do of an old favorite yet. I have no reason not to, I actually want all of you to have a roll for breakfast tomorrow, because it’s Sunday, so why not? Me and cottage cheese rolls go way back. All the way to my childhood where I would sometimes sneak into a bakery on my way from school to my mom’s work and buy myself a sweet cottage cheese roll. I didn’t care too much for walnut rolls, even chocolate ones. 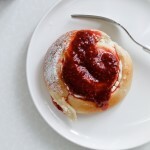 It was the image of a big, fluffy cottage cheese roll, filled with an abundance of creamy sweet cottage cheese and heavily dusted with powdered sugar that got me. And these rolls still have that same effect on me. You show me one, I want it, I want two. Well, I’ll take anything with cottage cheese, really, I just love it so much. And cottage cheese is an essential ingredient in Slovenian cooking, so I guess the love for it is embedded in my DNA. 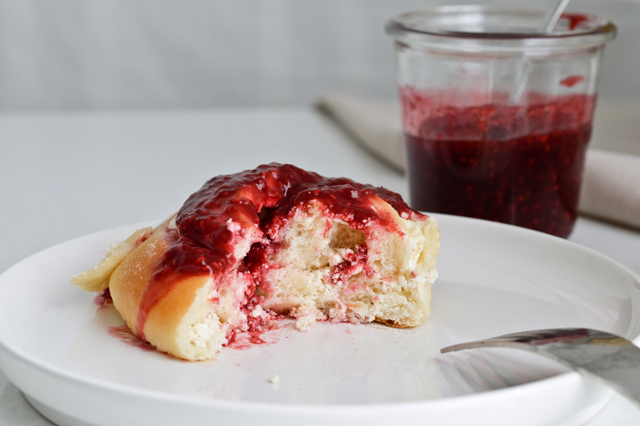 Strudel, potica, dumplings, … they’re all my favorites. But let’s go back to these sweet lemon cottage cheese rolls. Fresh cottage cheese is sour and not always everyone’s favorite, but when you add sugar and lemon zest to it, it completely transforms. And did I mention sour cream and vanilla bean paste? Put all of that in and you get the fluffiest, creamiest cottage cheese, with aromatic specks of vanilla spread everywhere. Truly a beautiful sight. 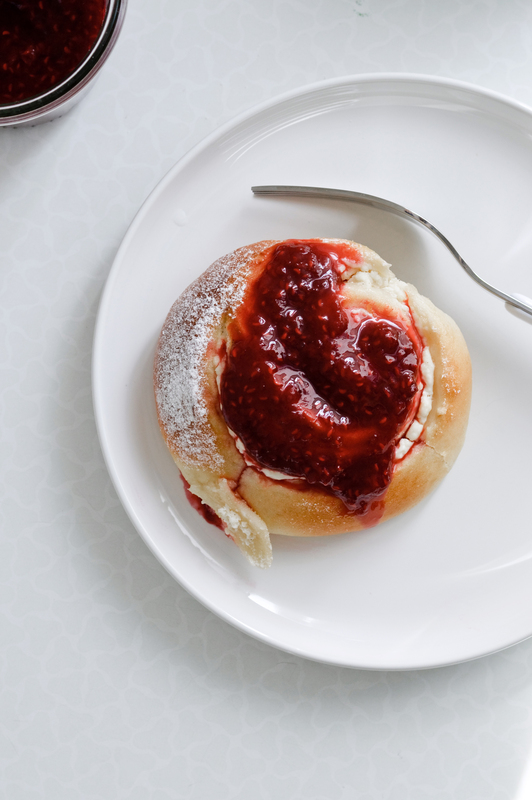 If cottage cheese isn’t your thing, you can always try making these with ricotta instead, but my heart holds a special place for cottage cheese. And what makes it more glorious are berries. I usually reach for blueberries, but really wanted to give raspberries a go this time. I really don’t know what I’d do without frozen berries, they are a life saver in the off-season months when I have to wait for fresh berries. 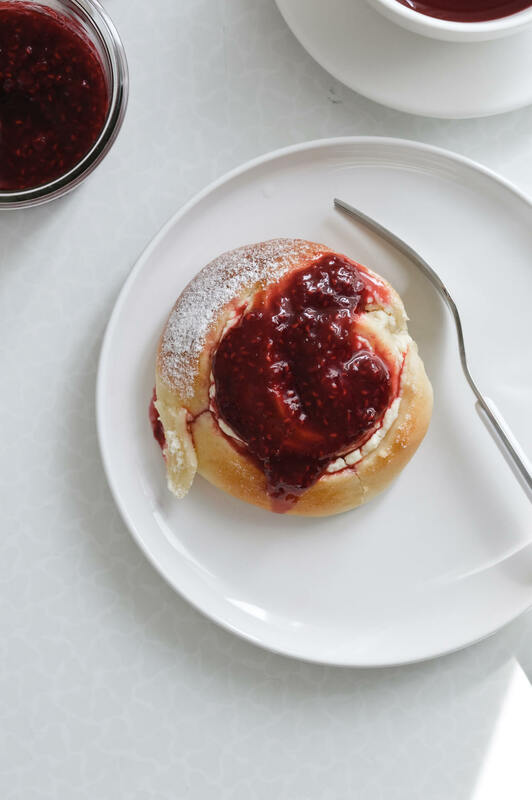 And a basic raspberry sauce is made in under 10 minutes, so I love to make it not just for these rolls, but as a topping for ice cream too, or even pancakes. And just like cottage cheese, it catches that wonderful balance between sweet and sour. 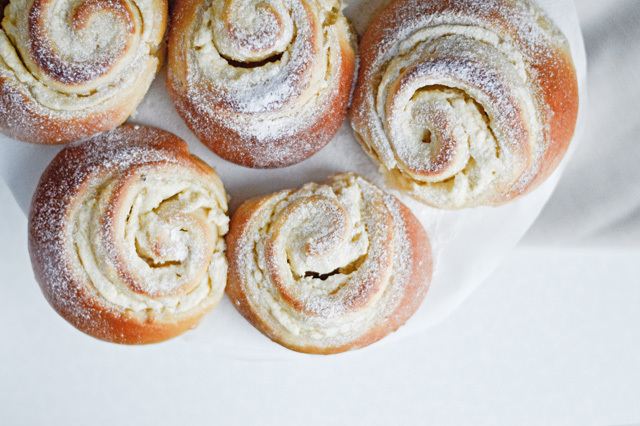 These sweet lemon cottage cheese rolls taste great cold and make a very filling breakfast. 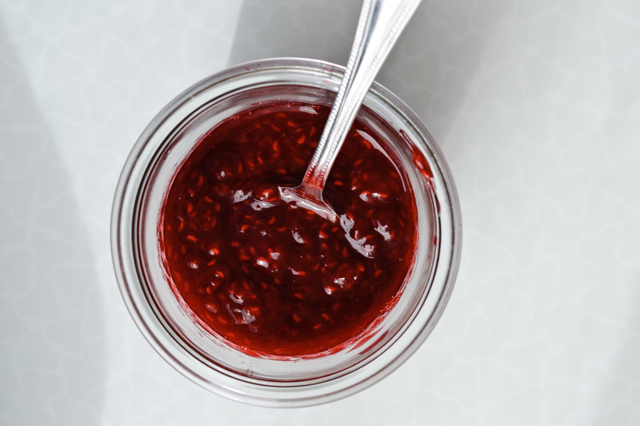 Served on a plate, with lots of raspberry sauce, they also make a wonderful dessert, perfect for a Spring lunch or dinner. 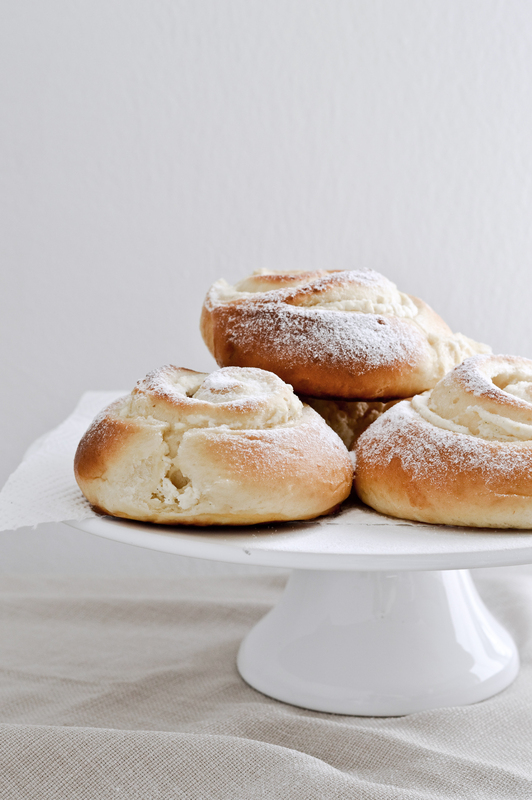 Fluffy rolls filled with creamy sweet cottage cheese and refreshing lemon zest. 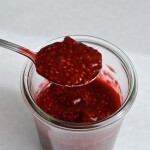 Add raspberry sauce for some extra zing! In a medium bowl combine the milk and one teaspoon of sugar. Heat in the microwave until milk is warm (like a warm, not hot!, bath). Stir to dissolve the sugar, add the yeast and set the bowl aside. Combine 2/3 flour, sugar and salt in your stand mixer (fitted with the paddle attachment) or food processor (fitted with the dough blade) or just in a bowl (using a wooden spoon). When the yeast has bubbled up, add it to the bowl, along with melted butter and 1 egg. Beat on low for a few minutes, the dough will be sticky, but smooth. Scrape it from the side of the bowl and add a few tablespoons of flour. Beat again on low until flour is incorporated and dough starts to clump together, forming a ball (or blob). Transfer dough to a floured work surface, add the rest of the flour and knead for a few minutes. Knead until the dough goes from sticky to smooth, elastic and you can easily shape it into a ball. Lightly grease a large bowl with oil or nonstick spray. Transfer dough to the bowl, turn it around until it’s completely coated. 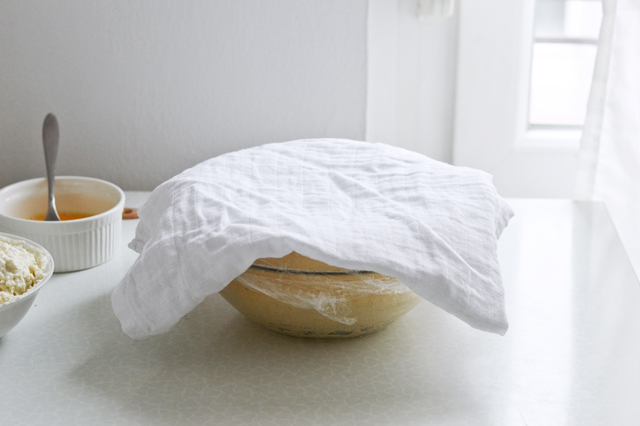 Cover the bowl with plastic wrap, then a kitchen towel. Let dough rise in a warm area, which is draft free, for about 1 1/2 hours. In a bowl, whisk together the cottage cheese, sour cream, sugar and vanilla bean paste. Lastly, stir in the lemon zest. Keep filling covered in the fridge as you wait for the dough. Punch down dough so it releases the air. Transfer to a floured surface and roll out to a 37 – cm (14 1/2 – inch) square. Lightly brush it with a beaten egg. 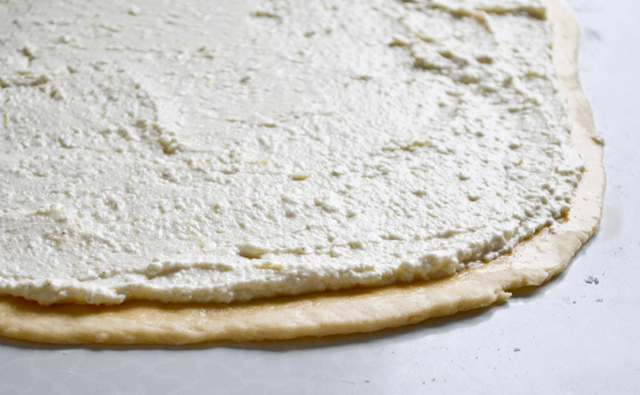 Add 3 tablespoons of the whisked egg to the cottage cheese mixture, stir well, then evenly spread cottage cheese mixture all over the dough, leaving a 1 cm (1/2 inch) border on one of the sides. Starting at the opposite side, roll dough into a log gently and tightly. As you roll it, keep brushing it with the egg. Pinch dough together at the seam. With seam side down, cut dough into 10 slices (2 ends + 8 in the middle), using a thin cooking string or very sharp thin knife. Be careful not to squeeze the roll! 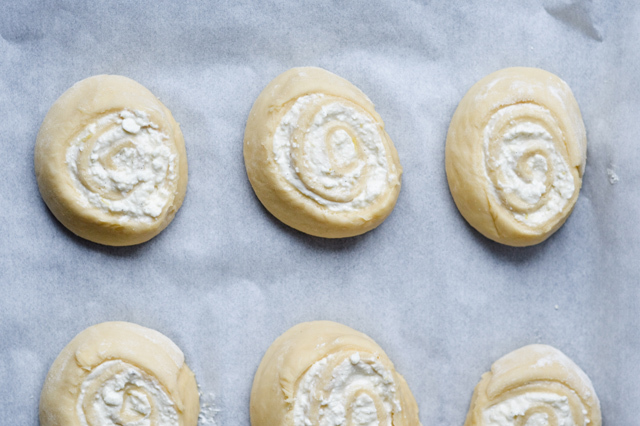 Place rolls on a baking sheet lined with parchment paper (cut side up), 1-2 inches apart. Cover sheet with foil and let rolls rise until almost doubled, about 20-30 minutes. Preheat oven to 180°C (356°F). Brush rolls on the sides with remaining egg, bake in the center of the oven until golden brown, about 20 minutes. Remove from oven, transfer to a large plate and serve warm or cold. 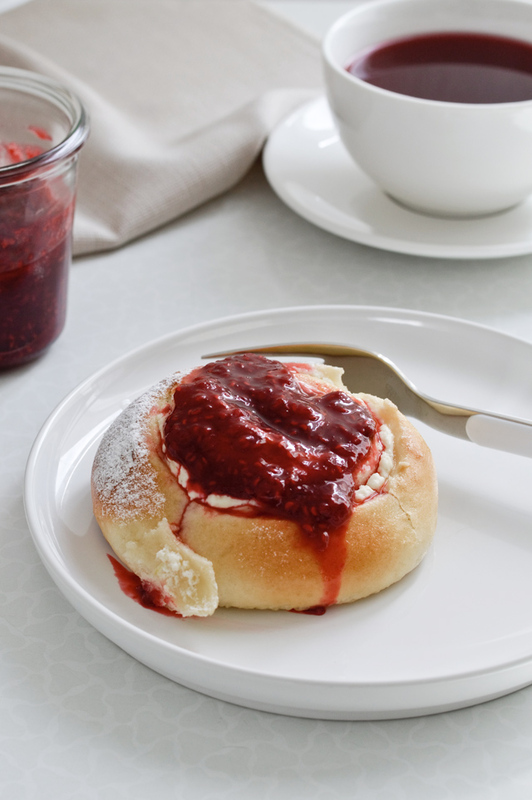 Sprinkle with powdered sugar right before serving and serve with a side of raspberry sauce. Keep leftover rolls covered in the fridge for up to 3 days, although know that they won’t be as soft on days 2-3, but still good to eat. What we call “cottage cheese” in Slovenia is actually quark. It’s a special type of curd cheese and it’s not as wet as American cottage cheese. 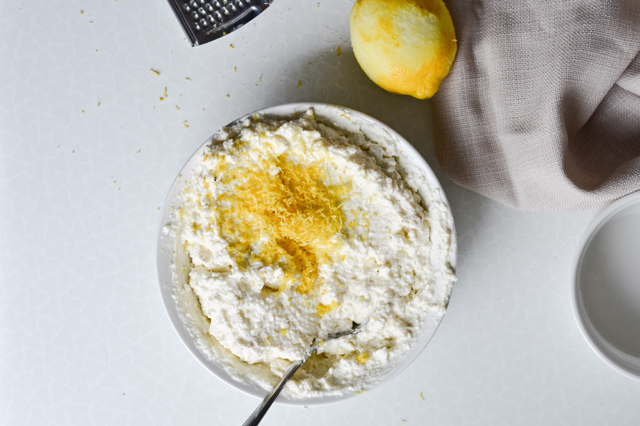 If you can’t find quark, substitute it with ricotta. A good mixture would be 4 parts ricotta, 1 part sour cream instead of the 1 pound of quark used. 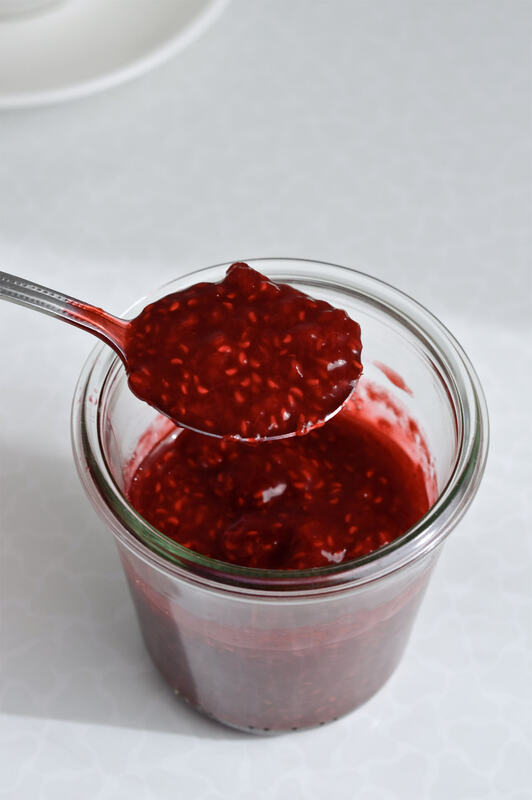 A quick raspberry sauce made with frozen raspberries, that is a perfect addition to cottage cheese rolls, ice cream, pancakes, yogurt, porridge and more. Recipe makes about 160ml (2/3 cup) sauce. Place all ingredients in a medium saucepan, stir and bring to a boil over medium-high heat. 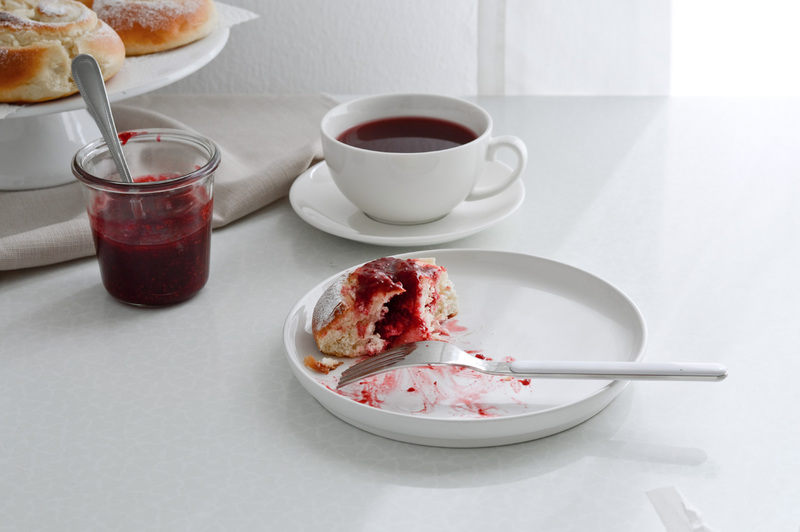 As the raspberries begin to thaw, start crushing them with a spatula and keep stirring. Maintaining a light simmer, keep cooking the sauce for about 5 minutes, until all raspberries are crushed and the mixture is a bit thicker. Taste to see if you want more sugar. Transfer sauce to a jar and let cool. It’ll thicken some more as it cools. Store covered in the fridge for up to a few days.